As an annual award, Flibbertigibbet salutes the one individual who has provided the most comedic material for satirical news in the last year. We’ve had many excellent candidates from around the world; with a vast array of howlers, incompetence and corruption. Not every bombshell dropped this year has been in Aleppo (-although it feels like it). Many might wonder why Donald Trump does not feature in our list yet to be fair he’s no longer a joke, but a reality. It’s been an incredible year for democracy, which has left most of us pining after a good old-fashioned dictatorship. IN THIRD PLACE: Boris Johnson. Who made Colonel Blimp head of the Foreign Office?!? Oh…we did…DOH! IN SECOND PLACE: Hilary Clinton. How do you lose to an orange f@cktard? Hilary certainly broke the glass ceiling – it just so happens that it turned out to be the bottom of a shark tank. 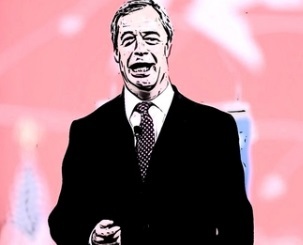 AND THE WINNER IS: Nigel Farage. He gave us Brexit, he heralded Trump and probably gave us all herpes. Our Nigel is the embodiment of bad news – and like herpes, he doesn’t seem to be going away any time soon. Have a Happy New Year & Thank you for supporting Flibbertigibbet! I’m not sure how 2017 can be any sillier. This entry was posted on December 29, 2016 by Wrenfoe in Caption Competition and tagged Comedy News, Flib News, New Year, Winner, Wrenfoe, Xmas.